This post describes an activity that addresses the shortcomings and potentialities of i. Intersecting process accounts, ii. Mapping by researchers of “connections” that motivated, facilitated, or constrained their inquiry and action; and iii. Historical Scan to set the scene in which a project is to be undertaken. 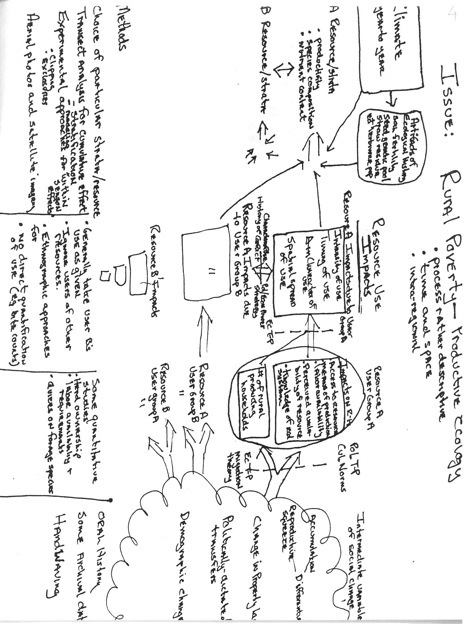 This entry was posted in reflective practice, Sci&TechStudies(STS) and tagged diagrams, freewriting, historical_scan, intersecting_processes, mapping, political_economy on November 23, 2010 by Peter J. Taylor. Although the goals of mapping workshops were not fully met in the initial experiments described in the previous post, lessons can be drawn for the more general project of helping researchers reflect on their situatedness and act self-consciously to change their subsequent scientific practice. 1. The workshop participants were self-selected and by no means representative of researchers. Almost all of them were advanced graduate students willing to commit time to reflect on their research and possible future directions. Having cut their teeth as researchers, they were now receptive to expanding the range of influences, both theoretical and practical, in planning their work. [i] The challenge for a workshop convener is to attract researchers other than students and to sustain their interaction long enough for maps to be revised and new collaborations to emerge. On a simple level, revision could be helped by suitable computer software to draw and redraw maps, so that researchers would be better able to respond to the input of other participants in the workshop. At a more fundamental level, workshop convenors who hoped to achieve wider participation and sustained interaction would need more institutional resources, workshop leading skills, and time than Haila and I had during these initial mapping workshops. 2. Mapmakers may not be successful in modifying the directions in which they subsequently move. The original assumption behind mapping was that identifying multiple potential sites of engagement would help mapmaker change, but a successful outcome does not necessarily follow. As it turned out, for example, E was not able to complete his study of urban carabid ecology. Making a map or producing some other account of how research is constructed provides no guarantee that researchers will become able to mobilize different resources to their advantage. Stanley Fish, an influential interpreter of legal texts and literature, takes this insight a step further and asserts that reflection on one’s situatedness is irrelevant to changing it (Fish 1989). Not surprisingly given my view that all scientific agents “assess… the practical constraints and facilitations of possible actions in advance of their acting” (see post on imagination), I dispute Fish’s assertion. It should be an empirical matter—one to be established through experiment and experience—which kinds of reflection, workshop processes, and modes of interaction and support contribute most to scientists modifying and restructuring the situations in which they undertake research (see Taylor 2005, Chapter 6, section C2 and C3, and Epilogue; also posts on workshops). Of course, would-be workshop conveners who hope to experiment and apply the experience gained would need resources, such as those to which I alluded in the previous paragraph. 3. 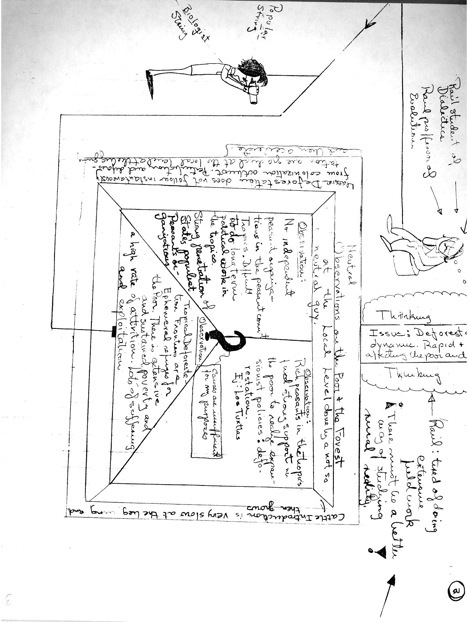 The maps were centered on the individual mapmaker, tended to be idiosyncratic, and were not explicit about theory about the researchers’ situatedness in society and its implications for their scientific practice. Again, further experiment and experience would be needed to promote more systematic map-making approaches and to assess their value. What might happen if, say, workshop leaders urged a standard format, offered models from analogous situations, or promoted various theories or propositions about micro- and macro-social change? Would some idiosyncrasy still have to be encouraged to ensure that scientists reflect freely on and consider changes in their own particular research settings? Deciding the extent to which to seek regularized, theoretically explicit maps recalls all the conceptual and methodological choices identified in Taylor (2005, chapter 5, section A): The boundaries of maps call out for negotiation—how far away from the individual researcher should the “horizon” of the map be drawn? Should something other than the researcher’s issue be placed at the center? If shifts in focus are entertained, the appropriate categories for interpreting and engaging with science are far from obvious. The traditional focus that scientists and philosophers place on scientific claims can be stabilized only by separating research questions from research work and social support. These realms are routinely traversed by scientists, however, even as they talk as if their scientific work derived only from the situations studied, not from their situatedness. Moreover, once mapmakers acknowledge the existence of resources in their work situation or in the wider social context, should they look for regularities or structure in those resources? Should they borrow from social theory and attempt to generalize about the situations in which research is done? To the extent that generalizations discount or filter out the contingency and idiosyncrasy of scientists’ actions, do they inject a degree of determinism not apparent in the individual situations? Finally, as answers to these questions are decided, mapmakers might ask what engagements or social actions they are privileging and facilitating. The questions could be posed not only to mapmakers but also to anyone “reflecting on their situatedness” with a view to “acting self-consciously to change their subsequent scientific practice.” Yet note the tension between pragmatic considerations and the logic of posing these as open questions (see discussion of practical reflexivity in Taylor 2005, chapter 5, section A). It is quite a challenge for mapmakers to choose and depict the diversity of connections around their focal issue, without the additional task of reflecting deeply on the categories, boundaries, generalizability, and so on, of their maps. Indeed, future workshop leaders may facilitate mapmaking by supplying a template of interpretive categories and themes. Even so, there is nothing natural about the depth to which mapmakers (or other researchers) reflect on their situatedness in seeking to change their practice. Any choice that mapmakers make or take for granted could be queried by their fellow workshop participants, who could ask how readily that choice could be modified. Such probing would begin to expose diverse practical considerations that support such choices. Mapping workshops offer a more direct path for bringing interpretation of science’s sociality to bear productively on scientific practice. But they do not escape practical reflexivity’s tensions and complexities, which remain not only for the mapmakers but also for workshop conveners. Conveners might want their workshops to distribute among others the work of interpreting and engaging with research, but this goal is unlikely to be realized unless the convenors have significant institutional resources, workshop leading skills, and free time. Whether such resources can be assembled is a matter not of the workshop conveners’ will alone, but of their distributed agency. In my own case, while waiting for an appropriate conjunction of circumstances for further mapping workshops, I used teaching and scholarly presentations to pursue another approach to encouraging researchers to reflect on their diverse resources,, which centered around the concept of intersecting processes. Fish, S. (1989). “Anti-foundationalism, theory hope, and the teaching of composition,” in Doing What Comes Naturally: Change, Rhetoric, and the Practice of Theory in Literary and Legal Studies. Durham: Duke University Press, 343-355. Novak, J. D. (1990). 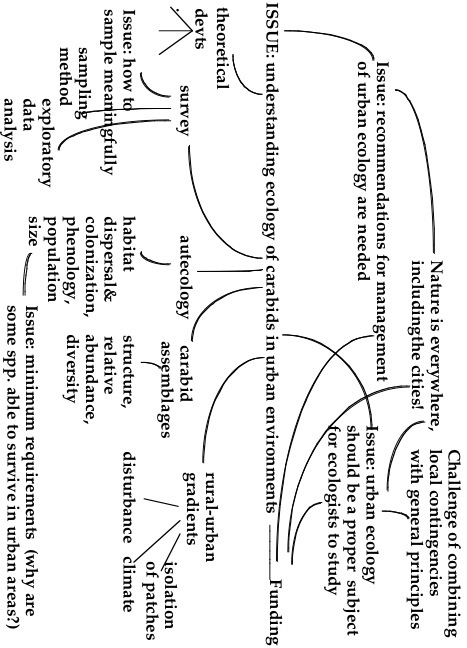 “Concept mapping: A useful tool for science education.” Journal of Research in Science Teaching 27(10): 937-949. One participant of the Helsinki mapping workshop observed that “one question leads to ten questions—What is a lake? Why is phytoplankton one category?…” Another likened mapping to the process of writing and revising: “Like writing, out of mapping comes awareness of new parts of the map that need more work.” Just as in a good graduate student dissertation research seminars, students raised a whole range of issues—from nagging uneasiness they feel about certain research directions to specific technical points—when these would have remained latent in a seminar dedicated to a specific theme. Mapping workshops certainly warrant attention from other teachers as an approach to stimulating advanced students to define their research (Taylor and Haila 1989). This approach, it should be noted, differs markedly from concept mapping (Novak 1990) in which the focus is on well-established relationships between concepts. Mapping as described in the previous post allows mapmakers to explore what is not yet clear about an issue on which they want to take action. This entry was posted in environmental studies, reflective practice, Sci&TechStudies(STS) and tagged mapping, reflective_practice, Sci&TechStudies(STS), workshop on November 21, 2010 by Peter J. Taylor.